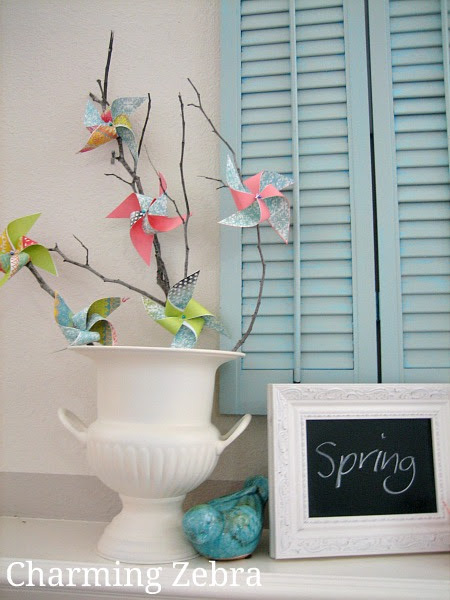 Pinwheels and kites are my two favorite emblems of Spring. And I love chalkboard paint and shutters too, all year round. So this fun Spring mantel is one of my favorites that I have seen so far this year. I love the makeover the urn received and the pinwheel tree that is now tucked inside is just about the cutest thing ever! You can see the tutorial for the pinwheel tree and see the rest of the details of this mantel over at Charming Zebra. Thanks, Lorie! I'm so excited to have my pinwheel tree featured.